The conversation on complexity has new energy. Plexus Institute has partnered with the #orgdna #twitterchat community to expand conversations on social complexity. Welcome to the dialog, as we collaborate to explore an innovative venue ! Social complexity is evident in the organization, where we see the workplace changing around us. Traditional organization structures like silos and control mechanisms routinely fall short of what’s needed. Demands for agility require new ways to solve problems. On this site we’ll host content to fuel an on-going discussion, bringing the #orgdna and Plexus communities into a common thread of conversation. How can we foster new methods based on our evolving understanding of complex systems? In a word, what is possible? As thought leaders and practitioners, we’ll need our combined energy, as we learn how to navigate the complexities ahead. HOW DOES IT WORK? It starts on Twitter. Nothing to sign-up for, all you’ll need is a Twitter account. Login to Twitter at the appointed hour. We recommend using a free streaming app like TweetDeck or TweetChat, searching on hashtag #orgdna; this let’s you can see the conversation in real time (note: your regular Twitter feed won’t show the latest tweets in chronological sequence by default; if you want to adjust this setting in Twitter, click the Profile icon, navigate to Settings & Privacy, then Content Preferences, and uncheck the box for “Show me best tweets first”). 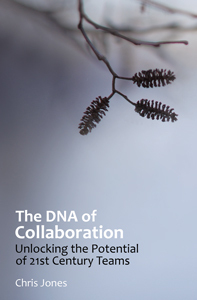 Planned topics are shared on the Collaboration DNA home page as a flexible “framing post” to guide the discussion, with moderation by @collabdna and @plexusinstitute. but you’ll also see @dgeaston, @complexified and @sourcepov actively leading the dialog. Everyone is welcome to join !! Add input to the conversation with your own tweets, making sure you include the hashtag #orgdna in the tweet itself, so the rest of us see them in the conversation. And that’s it. We’ll publish a link to the transcript after the conversation, so you can see what was shared, and follow-up on any threads you may have missed. We’ll meet six times each year on 3rd or 4th Saturdays. Our #orgdna home page has the latest. Questions? Contact Denise Easton, Bruce Waltuck or me, Chris Jones for more. Add comments here, or tweet your thoughts. And we hope to see you online! Do we have an agenda? Yes, but it’s evolving as we learn. We’ve captured our key ideas and themes to date using Coggle, and our #orgdna roadmap is posted here, in the creative commons – CC4-BY-SA. Have a look, we’d love your thoughts. What is #orgdna? It’s a self-selecting community of #orgdev and #complexity thinkers, discussing collaborative aspects of the organization since 2012. What is a #globalchat? When topics have a global impact, connecting with thinkers across the globe can be valuable. Twitter chats can be timed to accommodate other continents, but it takes some planning. This has led to our Saturday slot, morning in the US, early afternoon in Europe. Our first formal #orgdna #globalchat was in October 2018.